Dan Dubowitz will introduce his project 'Fascismo Abbandonato’, on display in the atrium of the MSD Building, and explore the challenges of Musolini's Fascist holiday camps and other megalomaniacal masterplans present to the societies who inherit them. 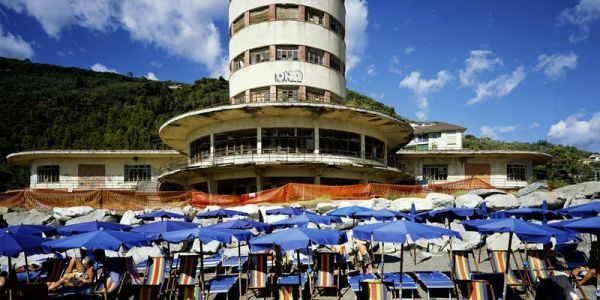 A number of Mussolini’s Fascist holiday camps for children have survived across Italy as ruins. This project is the second in a trilogy of long term research projects on ruins. Dan Dubowitz is Professor of Architecture at Salford University. He is an interdisciplinary urbanist, artist and architect who has created site specific city-scale works in Manchester and has developed a series of cultural masterplans across the UK. In 2003 Dan established 'Civic Works', a collaborative practise that specialises in regeneration projects and cultural masterplanning. The practice has developed and delivered cultural masterplans for city-scale developments across the UK. In parallel focused on completing artworks for the public realm (ranging from fine art photography and sculpture to trans-disciplinary collaborations with choreographer and performance) and developed and delivered cultural masterplans for city-scale developments across the UK.